Our wax melts / tarts are packaged in a clam shell that holds 6 tarts. Each package weighs approx. 3 ounces. Below is the beginning of the list of fragrances. These are all of the fragrances beginning with the letter P. I will have a listing for each letter. You can also order any fragrance and in the notes let us know you would like to substitute it for a different scent. 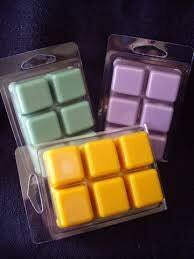 These premium soy wax melts have a fabulous fragrance. 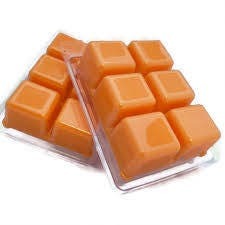 We add as much full strength premium fragrance oil as the wax will hold in each melt. We color each one to match the fragrance, if you have a color preference or prefer plain white let me know and I will make it for you. Each individual wax melt lasts between 6 & 10 hours depending on how you use it. So if used one at a time in a small wax warmer one clam shell will last 60 to 100 hours. Ours are tested in an electric wax melter and last nearly 10 hours. The fragrance stays true and one tart is enough to fill a large room with fabulous fragrance. Easy, fast, and just as described. Sorry to be bias, but I just love their products! The price is reasonable yet nothing was left out! There is a wow factor in all of her tarts!